Want a super cool phone with great performance to match its good looks? Then check out the TigerMobiles.com range of deals on phones from Apple. You'll get the coolest phone on the block, with awesome specs, and some very cool special features to match. All you need to do to start shopping to find the best deal is to use our simple comparison tool below! 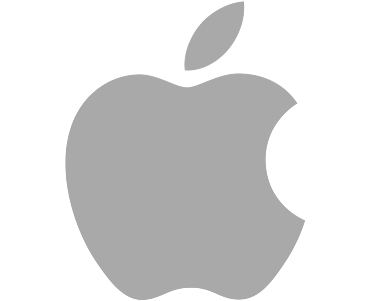 Apple is one of the most recognisable names on the electronics market. Founded in 1976 as a personal computer company, in 2007 they released the first generation iPhone and changed the way mobile phones looked and were used across the globe. Nowadays, Apple phones are ubiquitous, and some of the best selling handsets in the world. The iPhone X: Celebrating the 10th anniversary of Apple's entry into the phone market, the iPhone X becomes the companies flagship model. Features new to the iPhone line include bezel-less design, OLED screen along with Face ID in replacement of Touch ID. The iPhone 8 Plus: Maintaining a similar footprint to the 7 Plus, with 1 key difference; the aluminium back is replaced with glass as wireless charging arrives on the iPhone. 1920×1080-pixel resolution at 401 ppi makes for a super sharp display. The iPhone 8: Smaller than the 8 Plus and 7% heavier than the 7, the iPhone 8 is currently the most popular iPhone on the market. Incorporating Apple's A11 ‘Bionic’ chipset: Six-Core CPU, Six Core GPU it provides a fluid user experience that you would expect from a top-tier handset. The iPhone 7 Plus: Combining quad-core processing power with a 5.5 inch screen, 3 GB of RAM, and a 12 MP dual rear camera. Plus, there’s 3D touchscreen tech too! The iPhone 7: Pushed down to a mid-tier handset in the iPhone product line but benefitting from a wealth of capabilities. Here you get quad-core processing power, a 4.7-inch screen, 2 GB of RAM and a 12 MP rear camera, and that 3D touch screen as well. The iPhone 6S: Released back in September 2015, the 6S finds itself perfect for those looking for a familiar iPhone design but at a more affordable price point. There’s not much compromise with dual-core processing, a 4.7-inch screen, 2 GB of RAM and a 12 MP camera, along with the 3D touchscreen. The iPhone SE: Finally, the iPhone SE is Apple’s smallest but most budget-friendly model, with dual-core processing, a four-inch screen, 2 GB of RAM, and a 12 MP camera. Be aware that Apple phones come in various memory sizes, with a choice of internal memory size for each model. More memory costs more money! Apple phones are always big sellers, and that's because they combine great looks and the “cool factor” with awesome performance and easy to use software. Why should you invest in one? If you want a premium phone that's going to look fantastic, then you want an Apple iPhone. One of the best selling ranges of mobiles around, iPhones are stylish, reliable, and get great performance. So get started looking for iPhone deals by using our easy to use comparison tool!